During the 1940s, a growing number of pastors educated at North Park Theological Seminary committed themselves to urban ministry and the cause of social justice. Douglas Cedarleaf, who would eventually pastor North Park Covenant Church in Chicago, was a student at North Park Theological Seminary in the early 1940s. He recalled a certain chapel message delivered during the Christmas season by a “white-haired lady” who worked at the Erie Chapel Neighborhood House on Chicago’s west side. Erie Chapel was a white church in the heart of Throop Street, a Polish-Italian community on the west side of Chicago. He and his wife Carolyn, moved by this woman’s commitment and call for justice and mercy, became active at Erie Chapel Neighborhood House’s ministry to children. After graduation Cedarleaf accepted an invitation to be senior minister of Erie Chapel Presbyterian Church, the body which sponsored the social outreach ministry. During the first year of his ministry Cedarleaf confronted widespread social injustice in his community. 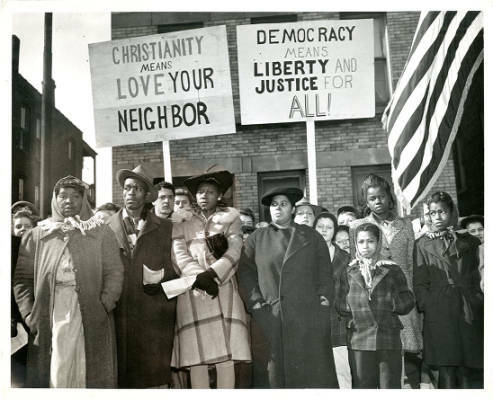 On a Sunday morning in February 1945, Cedarleaf preached a sermon entitled “Vandalism in Throop Street,” in response to reports of violence against the Strongs, a black family that had recently moved into the white community. Mr. and Mrs. Strong, along with their son and niece, had barely settled into their second-floor apartment when white neighbors hurled rocks, shattering many windows, and the neighborhood buzzed with threats that a mob would burn down the house. In the midst of this madness one of the Strongs’ neighbors, John Vilna, invited the Strongs to his church, Erie Chapel Presbyterian. With the Strongs sitting among his congregation, Cedarleaf condemned the violence from the pulpit, urging his listeners to “love their neighbors as themselves” and resist the temptation to fear those who are different. After the service was over, he taught his congregation “Lift Every Voice and Sing” and invited them to join him in escorting the Strongs home. An overwhelming majority of the congregation accepted his call. Doug Cedarleaf, clad in full ministerial regalia led the singing band through the streets of Chicago to the Strongs’ front door. Once they arrived, the congregation sang “Blessed Be the Tie That Binds” and formally welcomed the family to the church and neighborhood. The story was reported on the front page of The Chicago Sun and was eventually picked up by Time magazine. The press coverage sparked a firestorm of letters from across the United States, some laudatory and others threatening and condemning. Cedarleaf received a Distinguished Service Award from the Chicago Branch of the NAACP, and official recognition from the Urban League and the National Conference on Christians and Jews. The Good News the Master promised was something more than “pie in the sky and then we die.” His spirit of love was incarnated in the communion practiced by the Jerusalem church. Evidently these people felt as Rauschenbush puts it: “It is impossible to have men sit beside you as your brother and let him go hungry while you feed. Therefore as the usual thing we do not let him sit beside us or we deny that he is our brother.” The church moved out of these low income areas and had gone ‘high society,’ or at least strongly middle class, denying the basic relationship. 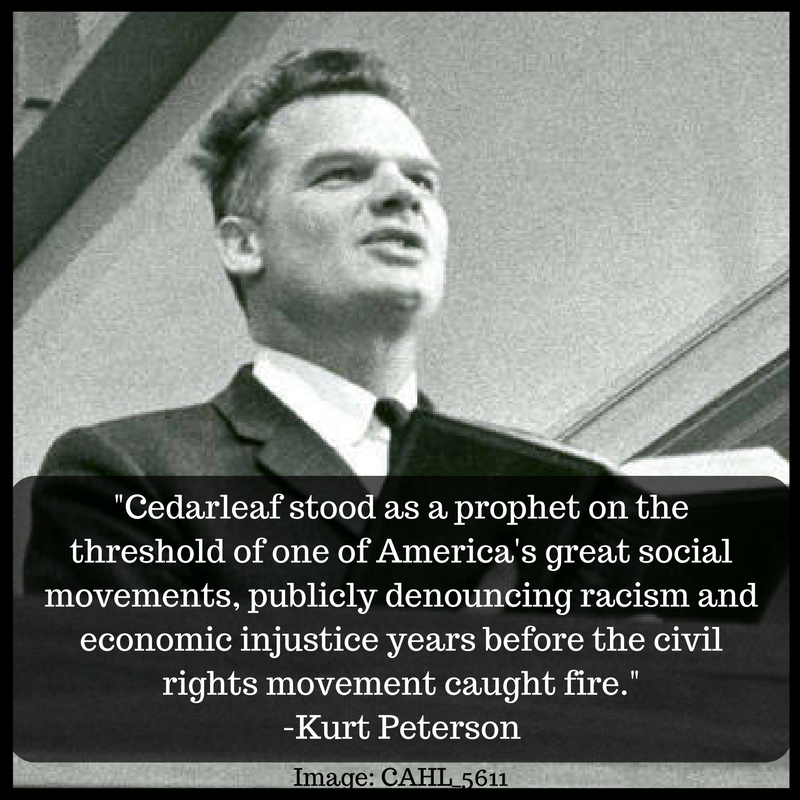 He did not propose social service as a substitute for a vital, personal relationship with Christ, “but rather as one of the channels through which the grace of God can flow.” By taking Christ’s call to social ministry seriously, Cedarleaf stood as a prophet on the threshold of one of America’s great social movements, publicly denouncing racism and economic injustice years before the civil rights movement caught fire. 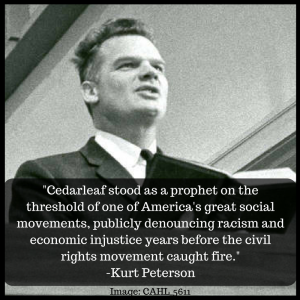 Read excerpts of Cedarleaf’s 1963 sermon here; full text here. 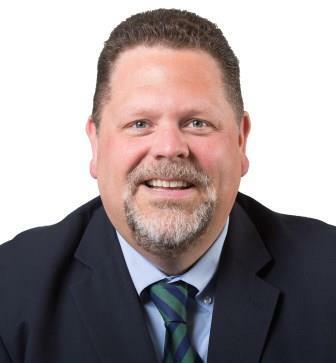 Kurt Peterson is assistant dean and director of development for the College of Arts and Sciences at Loyola University Chicago. Prior to joining Loyola in 2012, he served as professor of history at North Park University. Peterson’s doctoral dissertation (Notre Dame), “Constructing the Covenant: The Evangelical Covenant Church and Twentieth Century American Religious Culture, 1920-197,.” contains more information on Cedarleaf and Covenant responses to race & racism here. The personal story behind this research is of particular note. When I read about this episode in Cedarleaf’s early ministry, I reached out (c. 1998) to Doug Cedarleaf and his wife, Carolyn, who were living at a Covenant retirement facility in Minneapolis. Peter Hawkinson, my deer friend and brother-in-law who was pastor of Richfield Covenant Church at that time, visited Doug and Carolyn in their home, and they shared with Peter a scrapbook of newspaper articles and personal letters surrounding the event described above. Peter photocopied all the pages and sent them to me in Chicago. Reading those scrapbook pages created both pride and deep pain. Doug was recognized for his leadership and Christian love, but he received several viciously-racist and condemnatory letters from local residents who feared neighborhood racial transition. That scrapbook is a snapshot of American urban history – I hope it winds up in the archives at North Park.